Hey, whats up everyone. I just wanted to see if anyone uses this product? If so, I would love your take on it. The company is out of Germany I believe and says everything in their products are only stuff that fishes encounter in the wild. I have not seen this food in the states. Since the site is not in English I cannot read it unless i run each page trough Google Translate.. That said, I have a hard time believing the claim that only things a fish encounters in its natural habitat are used. The only way this could be true is if there are a variety of geographically specific formulations. What is found in the the waters of the Amazon and its tributaries vs is what is found in the rift lakes of Africa or the habitats in Australia are clearly not the same. The vegetation is different, the pH or TDS are different, the inverts are different etc. So how can it be claimed that one food only contains what is in the natural environment of the fish when common sense would indicate this is impossible.And lets not forget that many foods have ingredients that help keep them fresh, or are used for consistency rather than nutritional reasons. Or what about nutritional additive like vitamins? However, the biggest problem I have is the line where it states "Panta Rhei foods is an all natural food containing foods fish would find in their natural environment. It does not contain terrestrial ingredients" The problem is that a lot of fw fish do eat terrestrial foods. They eat fruits and nuts which fall into the water. Some fish may eat land animals that fall into the water- think piranah. Or what about the catfish in France which lunge onto the shore to grab and eat pigeons? One caveat here, most of what I could find in English re this food all deals with salt water/reef fish. 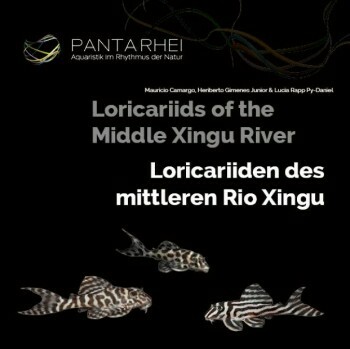 But I have to assume they must do something in regards to fw fish since they published one of the few fish books I own, Loricariids of the Middle Xingu River. This is basically a book about the Big Bend where zebras live. It is a really neat book for a number of reasons not the least of which is every page appears twice, one is written in English and the other in German. It is also unique in that not only does it show pictures of the fish, but it also includes pictures of the area of the river where the fish is typically found. Also, I am not sure I buy into this sales pitch. For many years I have been feeding all my fish once a week on a food supplemented with garlic and paprika. Neither of these ingredients is natural in terms of fish. However, I have taken the time to read a lot of scientific research on garlic and fish and the science shows it's benefits. These ingredients would never be included in any Panta Rhei fish food. Great video! They have an unbelievable collection indeed. I'd love to visit the place myself if only I was closer to that place. Gel formula composed of Black Soldier Fly Larvae, Mango, Papaya, Organic Banana, Fig, Krill, and Squid suitable for all fish species. The Black Soldier Fly Larvae are sourced in the USA and grown on a natural diet. The fruit powder is human food grade quality! Ingredients: Black Soldier Fly Larvae Meal, Mango Powder, Banana Powder, Fig Powder, Papaya Powder, Squid Meal, Krill Meal, Dandelion Powder, Vitamins, Trace Elements, and Minerals. That store has gorgeous tanks and some neat fish. i envisioned that sort of slanted river tank a long time ago and knew it was impossible in my home. it looks perfect in the shop, I am so jealous.